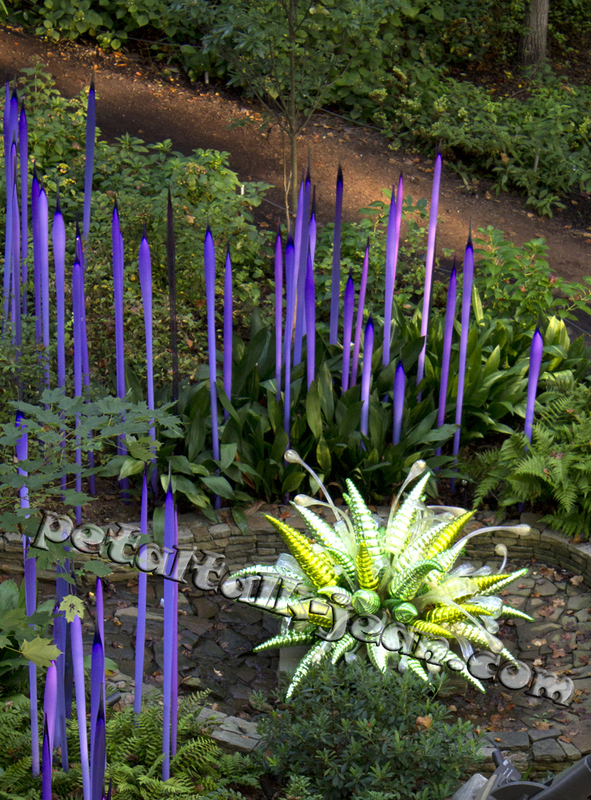 The Atlanta Botanical Garden is hosting a display of works by Seattle artist Dale Chihuly through October 30, and the double-wow vignette you shouldn't miss involves several of the glass pieces placed near a permanent live sculpture. The sculpture, brought to life with plants, is called the "Earth Goddess." 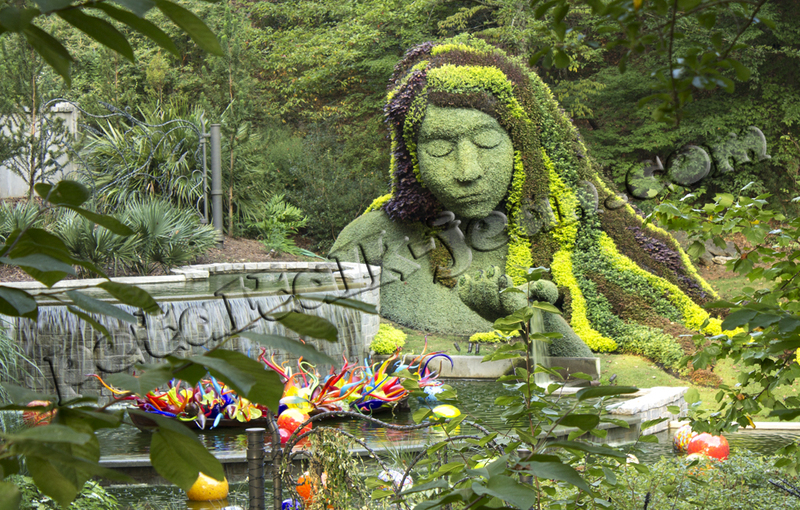 It was created by Mosaiculture International for a two-year exhibit (from 2012-14) called Imaginary Worlds at the Atlanta Botanical Garden. 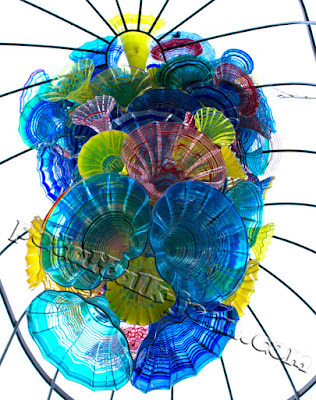 The Earth Goddess is highlighted by glass works by artist Dale Chihuly. "In winter, the Earth Goddess is stripped of the annuals covering her, and she is covered in blue and white lights to become the Ice Goddess in our holiday light show," said Danny Flanders, Public Relations & Marketing Manager for Atlantic Botanical Garden. "Then the next spring, she is covered again with the planting medium and replanted with annuals." A Trumpet Flower Arbor dangles from a circular metal structure built over a path to the Children's garden. It's the biggest departure from the artist's other works in the garden and was created in 1997. I almost missed it, hidden in plain sight right above our heads. 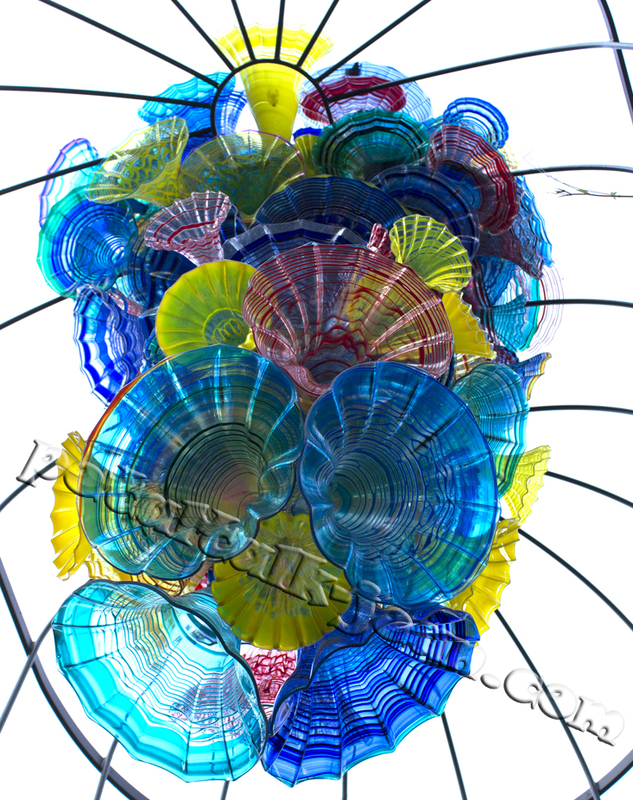 As much as Chihuly's art could possibly blend into the backdrop, I imagine Trumpet Flower Arbor is amazing when the sun is directly overhead. 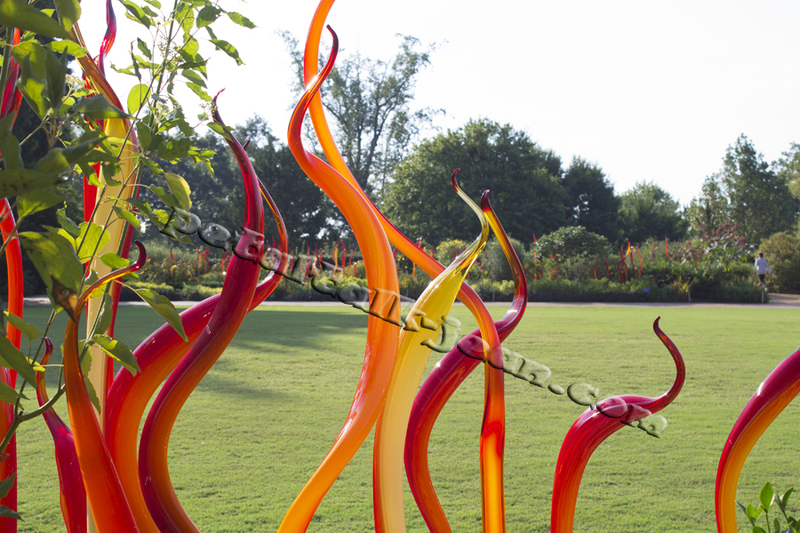 One of my favorites, and an installation that refuses to be ignored, is Caramel and Red Fiori, consisting of upwardly undulating glass spikes. 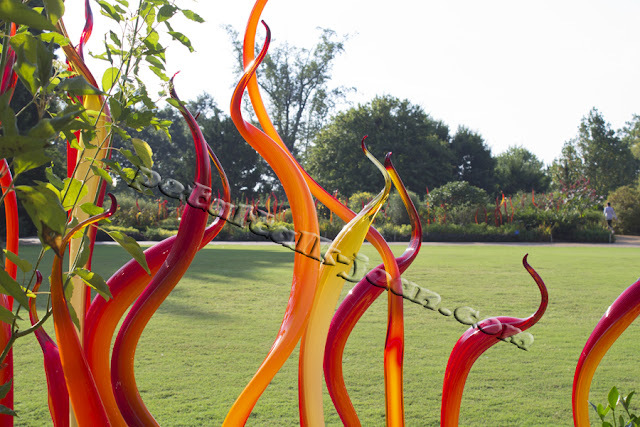 Each piece falls in a loose line among the garden beds surrounding the Great Lawn outside the conservatory. 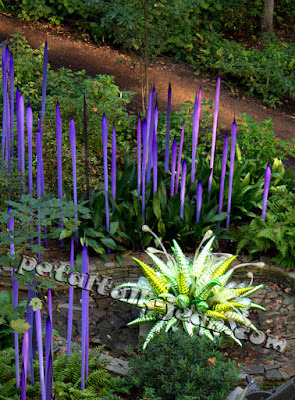 "Green Hornets and Water Drops" reminded me of Christmas ornaments, but the Neomydium Reeds just reminded me how great purple looks in a garden. I'm sorry to say I didn't have much time to spend in the garden. It's only 30 acres--small by American public gardens' standards--but an hour and a half was definitely not enough. I was ecstatic to stumble upon a dog made of grasses. 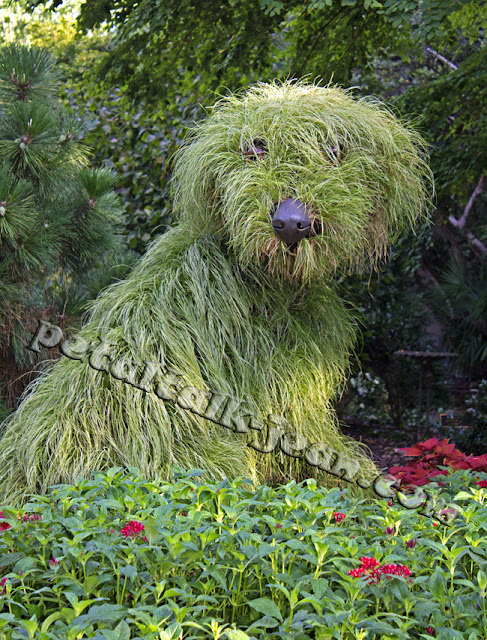 The Shaggy Dog, which was part of the Imaginary Worlds exhibit, found a home in Atlanta when International Mosaiculture donated him to honor the garden's volunteers. According to Flanders, the volunteers planned to raise the necessary funds to "adopt" Shaggy because they'd grown so fond of him. I have too. The Shaggy dog by Mosaiculture International. These living sculptures are fabulous. The dog seems alive. Chihuly is something else. Gorgeous pics, Jean! Wish I could have attended!